Comedian and TV show host Trevor Noah posted the video on Instagram and wrote "they just won the Keke challenge"
Geela Anil Kumar and Pilli Thirupathi's freestyle groove and swirl won the hearts. The internet, it appears, has finally crowned the winner of the dangerous Kiki challenge. No, it's not an actor, celebrity or any dancing legend. Two farmers from Telangana have claimed the victory with their safe and eco-friendly no-car performance. Comedian and TV show host Trevor Noah posted the video on Instagram and wrote "they just won the Keke challenge". 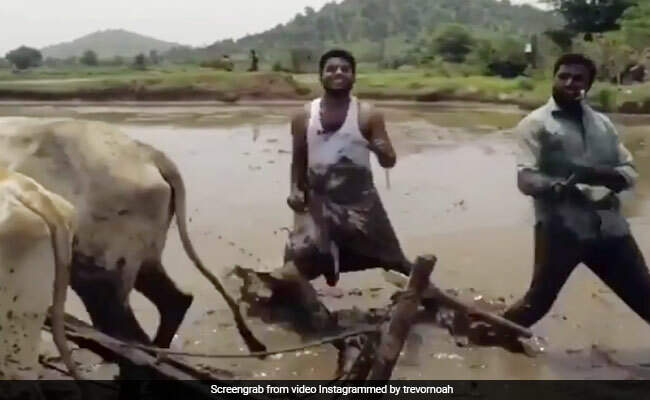 Geela Anil Kumar, 24, and 28-year-old Pilli Thirupathi's freestyle groove and swirl while knee deep in mud, ploughing the field with a pair bullocks isn't something that you usually click on. But their simplicity, innocence and rustic charm clubbed with the peppy beats of rapper Drake's hit song "In My Feeling" attracted the netizens in hordes. The video has been viewed millions of times and the count is swelling by the minute. The video was conceptualised and uploaded by filmmaker Sriram Srikanth on his YouTube channel "My Village Show", which showcases "culture, development activities, festivals, fun things, awareness programmes, short films, political situations and everything" about his village Lambadipally in Karimnagar district of Telangana. The challenge intrigued him when he saw a message from the police advising against dancing alongside a moving car. His curiosity took him to numerous Kiki videos which he found quite risky. He hadn't heard of the artiste, but liked the song. So he decided to shoot a safe yet fun version. He discussed the idea with the duo from the village and they loved it. Soon they were practising, but when they shot it, the best moments came from their impromptu moves. Mr Kumar, who aspires to be an actor, enjoyed the whole experience. The newest trend on social media, which involves jumping out of a slow-moving car and dancing alongside, the Kiki challenge is also known as the In My Feelings challenge or "doing the Shiggy", thanks to comedian Shiggy who posted a video dancing to the song. Some videos of the challenge uploaded on the internet show oblivious dancers crashing into poles, tripping on potholes, getting hit and even falling out of cars, which prompted the agencies to issue warnings against it.